A. View our shipping information here. Need your personalized order quickly? We may be able to expedite the production time on your order for a fee of $10 - $40 per item depending on the product. Please contact Customer Service at 800-821-7011 to request expedited production. A. Many of our invitations include the option to change the color for part if not all of the design. Colored ink is available on all invitations and can be viewed when you begin personalizing. Invitations that are tagged as having more color options often give you the ability to change not only the wording, but the design as well! A. Absolutely! The majority of our invitations can be personalized using any wording you'd like. For no extra charge, we'll print your original wording on your invitations. If you have questions about invitation wordings, verses or formats, email our customer service team at service@AnnsBridalBargains.com or call us at 800-821-7011 and our friendly representatives will be there with the answers you need. Q. I am in a RUSH! How can I receive my order faster? A. We may be able to expedite the production time on your order for a fee of $10 - $40 per item depending on the product. Please contact Customer Service at 800-821-7011 to request expedited production. Want quick shipping? We have several shipping methods including Standard Ground, 3-Day, 2-Day and Overnight. A. We will make every effort to catch your order in time to make your requested changes, however our fast turnaround time can make this difficult so we cannot guarantee your changes will be made after the order is submitted. A $10.00 fee will be applied for changes and/or cancellations. If your order is already in production, you will be charged in proportion to the work already completed. A. Absolutely! Call us at 800-821-7011 and we’d be happy to assist you. A. We do! Orders shipping to APO, FPO or P.O. box addresses can only be shipped through the U.S. Postal Service. A. Yes! You’ll need to create an account to ensure your changes are saved and accessible from any device (including mobile and tablets). To save an item while you’re personalizing, click on the Save for Later button in the upper right corner of your screen. If an item is in your Cart, it will automatically be saved to your account’s Saved Projects. Q. How can I find items I’ve personalized and saved? A. To see your saved items, sign into your account and navigate to the My Saved Projects link. Q. Do you print invitations in languages other than English? A. Yes! You can personalize with any language using the English alphabet in our online personalization tool. Need help using a language that does not use the English alphabet? Call us at 800-821-7011 and we’d be happy to assist you. Q. What is corner copy? Some couples will choose to include information in the lower left or right corner of their invitation. This could be reception, respond or dress code information. Corner copy appears in the bottom left or right corner depending on your design. Q. What kind of paper do you offer? A. Because we offer such a wide range of invitation styles, we also have a wide range of paper. Please refer to the Description and Details for each item to learn more about the paper used. Many of our invitations and enclosure cards let you choose what kind of paper you would like us to print on. View the options here. Q. Is it possible to change the size and/or color of the invitations you show? A. Usually the invitations shown on our website are available only as shown but you can still make the invitation uniquely you by selecting your fonts, ink colors and wording. There are some exceptions to the "As Shown" option. If you are interested in finding out about a specific invitation, please e-mail us at service@AnnsBridalBargains.com or call toll-free 800-821-7011 to speak with a Customer Service representative. Q. Can I customize my invitation with my own artwork? A. We would be happy to assist you with this. Please contact Customer Service by emailing service@AnnsBridalBargains.com or calling toll-free 800-821-7011 to speak with a representative. Q. Can I have our picture printed on my invitation? A. We offer a large selection of photo invitations for you to choose from but if you find an invitation you like and it doesn’t feature a photo, you may call Customer Service to see if adding a photo is possible for an additional fee. Please e-mail us at service@AnnsBridalBargains.com or call 800-821-7011 to speak to a representative. A. Digital proofs are available during checkout for an additional charge, which means a digital rendering of your invitation will be emailed to you for your approval prior to printing. PLEASE NOTE: your order will be placed on hold and you will not be charged until we receive your approval of the proof. Once approved, your order will be processed. A. Yes, we can! Contact our Customer Service team at 800-821-7011 to speak to a representative about assembly charges for your invitation. Q. Do you offer envelope liners? A. Lined inner envelopes are available in a variety of colors for invitations that include both inner and outer envelopes. We do not sell envelope liners separately, and outer envelopes are not available with liners. A. Yes, we can professionally print your envelopes with your return address and/or recipients' names and addresses. It's easy! Simply begin personalizing your invitation online then follow the simple steps on the Envelope Options page. View more details here. Q. How many invitations should I order? A. We suggest you have your guest list finalized before you place your invitation order. Then you will know how many invitations you will need and not have to guess at the number. You will send one invitation per household unless there is a resident of the household over 18. Young adults should receive their own invitations. Be sure to order invitations for the wedding party as well as for keepsakes. We also suggest you order an extra 25 to help you avoid costly reorders, which start over at the original price. Q. How do I word my wedding invitation? A. The wedding verse you choose is determined by who is hosting your wedding. Once you begin personalizing your invitation online, you'll be able to choose from a wide range of verse options. Often, family situations determine how your invitation should be worded. A. Blank outer/mailing envelopes are included with all Ann's Bridal Bargains wedding invitations, unless noted in the item description. Inner envelopes are included with some invitations. Your invitation and enclosures are tucked inside the inner envelope, which is tucked inside the outer envelope. Inner envelopes should be addressed with the first names of all guests included in the invitation so there is no question as to who exactly is invited to the wedding (for example, just parents or parents plus children). A. For wedding celebrations, it's typical to order two cocktail napkins and two dinner napkins per guest. However, the number of wedding napkins needed may change depending on the style of celebration. For example, a cocktail and hors d'ouevre reception would need four cocktail napkins per guest. A plated meal with cloth napkins would only need two cocktail napkins per guest. For all other celebrations, it's best to order two cocktail napkins per guest. We even suggest ordering three per guest if the celebration involves a fair amount of food and beverages. A. We suggest sending wedding invitations out 6-8 weeks before your wedding. Be sure to request that your guests have their rsvp back to you 3-4 weeks prior to your wedding or several days before your caterer needs a final head count (whichever comes first). Is your wedding over a holiday weekend or are you having a destination wedding? Be considerate and send your invitations 12-15 weeks prior to your big day! 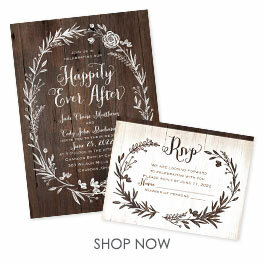 Since invitations should be sent 6-8 weeks before the wedding, we recommend ordering at least 10-12 weeks prior. For holiday and destination weddings, we recommend ordering at least 17-19 weeks prior. A. Six months before your wedding is a good rule of thumb when sending out save the dates. If your wedding is over a holiday weekend or if you're having a destination wedding, we suggest sending your save the date 9-12 months prior to give your guests time to book travel and accommodations. A. If you have concerns or issues with personalized products, please contact customer service for assistance. If you are not completely satisfied with any non-personalized product you purchased from Ann's Bridal Bargains due to a defect or poor craftsmanship, simply return the merchandise within 30 days to receive a replacement or full refund. Customers are responsible for original shipping and handling charges unless an error occurred on our part or if the item was broken en route to you (in this case, please call the customer service number below). Please note: our return policy may not apply to some items if returned after your wedding date. If at any time you have questions, our friendly and knowledgeable customer service representatives will be more than happy to assist you. Please call 1-800-821-7011. A. We want you to be happy with the way your photo looks on your invitation or save the date, which is why a warning will appear if your photo will print grainy or pixilated. If you receive this warning, we suggest using the original, unedited version of your photo. Black and white images should have a resolution of 600 dpi (dots per inch) or higher. All other images should have a resolution of 300 dpi or higher. A. If you have questions on how to enhance the quality of your photo or increase the dpi, please contact a Customer Service Representative at 800-821-7011. Also, please make sure the preview is acceptable to you as this is how your order will be printed.